We’ve been rolling out new versions of Google Maps for mobile at a fast pace lately, and the first Google Maps for BlackBerry update of 2010 is a big one. For version 4.0, we’ve added new features to help you find places faster, post from those places with Google Buzz, star them for quick access, and more. For starters, we’ve added Search by voice to all BlackBerry devices to save your overworked thumbs. Simply press and hold the green “call” button, speak your search, and see your results quickly appear without typing a single letter. 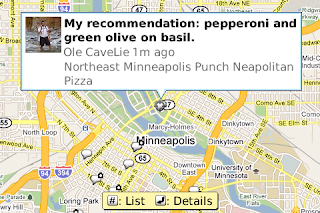 Try it now for any search, like the name of my favorite hometown pizza place, “Punch Pizza in Minneapolis.” You can also search by voice for addresses like “802 Washington Avenue Southeast” or search for other another pizza place to try by speaking, “pizza restaurants.” Currently supported languages include multiple English accents and Mandarin Chinese. Google Buzz for mobile also makes its debut on BlackBerry phones in Google Maps 4.0 (see availability). Use the Google Buzz layer to see what’s going on around you or to post to the layer yourself. Check out the many ways to explore the Buzz layer in Google Maps for mobile, including sharing pictures, news, and more. From the Maps main menu, select Layers > Buzz to enable the layer; open the menu and select “Post Buzz” to add your own public post from a location or place. Take your searches and starred places to go. Just like in Google Maps on Android, the BlackBerry version now provides personalized search suggestions from your maps.google.com search history. If I previously searched for “Punch Pizza” at home, I can simply type “pun” into Maps on my phone to see “Punch Pizza” at the top of the suggested search terms. Make sure you’ve signed in to your Google Account (Menu > Sign In) and have Web History enabled for your account. Signing in to your Google Account also synchronizes starred items between maps.google.com on your computer (My Maps > Starred items) and phone (Menu > Starred Items). I’ll do my heavy pizza research at home, star several pizzerias I want to try, and browse the list in Google Maps on my phone when I’m ready to eat. Use Labs to try experimental features like the Scale Bar or Terrain layer (great for hiking enthusiasts!). 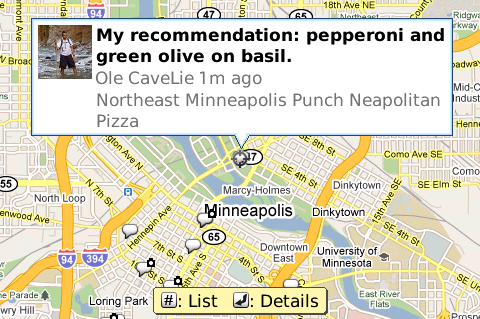 See nearby businesses at an address or location by selecting a point from the map. 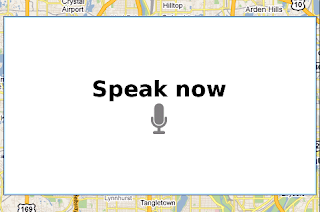 Report a problem with the map data or a business listing. To get started, install the latest version of Google Maps 4.0 for BlackBerry by going to m.google.com/maps in your BlackBerry’s Internet Browser. The update for BlackBerry Enterprise Server administrators and users, including support for BlackBerry OS 5.0 phones, is available here. Visit our Help Center to learn more or tell us your feedback and questions in our Help Forum. Give us suggestions and vote on other people’s on the Mobile Product Ideas page! Are we getting navigation soon :) ? 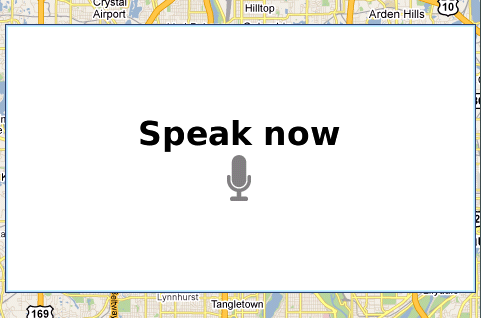 ...and i'd like to second it, better gmaps for webOS please! Thanks. Good update. Now if you could only make the MyMaps and Starred items work with Google Apps accounts. I am trying to get everything down to 1 address but keep running into limitations like this. cant navigate on storm.. touch screen not working. All storm users facing this?? I am expecting local search history upload into the cloud. I, for one, hope Google buried the hatchet with Apple a bit and tomorrow's iPhone OS 4.0 preview will include updated Google apps and better overall integration of them. What? A guy can hope, right? If not, hello Android. Search by voice doesn't work on Bold 9000. When press Call button then move to the dialing screen. HUZZAH! Thank you google for not forgetting us crackberry addicts! Not working on my Storm2 with .607 OS. How can I download the prior version until this is sorted out? It works great on my BB 8520, thanks Google! Exellent news For Blackberry Users For Sure. Google Maps Still Needs Work Though. Not to seem too needy, but what would really bring joy to my heart would be a gmail Blackberry upgrade with support for applying labels. Hooray!! Some BlackBerry love!! Next, might I suggest a YouTube app. There currently is none for BlackBerry, and it would be amazing. Hi, i just install the Google Maps 4.0 in my Storm 2, it's not working?! Anyone know why? is google going to upgrade google maps java ver. too? b'cause m too excited about the new features and would like to try them on my samsung star mobile. also, will google maps have an option to login to my account and share my location with my friends? "Google Buzz for mobile also makes its debut on BlackBerry phones in Google Maps 4.0 (see availability)." Yet, when one clicks on the Link, they are told that Blackberry application is "coming soon." Which is it? Just downloaded 4.0.1 for my BB Storm. Touch screen is NOT working. Thanks for update, voice is greatly appreciated. But please please please give us navigation (turn by turn specifically). Some of us are stuck on blackberries at work but would love an android phone with this but can't unfortuanaly. touch screen can't work on the BB storm... i can't use the new google maps at all! Congratulations on making the best app on my Storm 2 a piece of crap. I can't even begin to describe how many ways it doesn't work. Please tell me how to revert back to version 3 or fix this fast. Can't rename starred items from the handheld? Really? C'mon! Agreed with the comments about wanting Navigation on BB and that being able to re-label starred items is a must, would also be nice if those labels could be searched by voice (for instance be able to label your home address and be able to voice navigate there). Is there anyway around this not being able to rename a saved favorite besides downloading old google maps using it then resetting it to new google maps? why would a company purposely downgrade their product and upgrade only some of their features. Very mad, I know they just did it so they can have an upgrade with it and call it a new feature. honestly, get a brain. thats plain terrible! Storm 2, Storm 2, Storm 2, Storm 2, Storm 2, Storm 2, Storm 2, Storm 2, Storm 2... Not Working. Official VZW OS- .607 Let's get this fixed please. Hello, I actually had Google Buzz integrated in Google Maps and it was a very fine and useful feature. But suddenly it disappeared from my Nokia E71. Now I see that it is not available in my country (Romania) and I was wondering why is that. If it worked why don't just leave it like that? I would really appreciate an answer. I know it is a little offtopic, but I couldn't find a post related to this change. Google: Do not disappoint Nokia Symbian phone users. Otherwise the "Buzz" will fizz out for us. roll out a Symbian app for "Buzz" ASAP. when will google maps 4.0 be fixed for storm2 607? Absolutely gorgeous! Finally a SCALE BAR!!! I've been wanting that since I first started using Gmaps on my Berry two years ago! Terrain maps are cool, I Like being able to save favorite locations linked to my account, and voice search is great! This was my favorite app on my storm. Now it is completely useless. C'mon Goog I expect better from you. unfortunately, the v4.0.2 link for blackberry enterprise server deployment is currently broken. please provide a fixed link or an alternate download location asap! We're on BES 4.15 and default permissions and the maps will not even start due to permissions. Permission changes fail work, same as with Google Mobile App but at least Mobile App gave you an option to ignore and start anyway. Maps will not start at all. I've loved this update from the first day! Thank you, Google, for not forgetting about us BlackBerry folks. The only two LITTLE things that I didn't quite like were- I find the new My Location arrow to be a bit too big, and I don't like that my starred items keep rearranging their order. - Can we get the ability to create new My Maps and add new points to existing maps from the BlackBerry? Thank you for your article. Then let's see something about cosplay. You must be interested in it. cosplay is big. Very big. China Wholesale More than half of all kids at anime conventions these days are cosplaying cosplay costumes. Relax, cheap cosplay costumes it’s nothing scary. Cosplay is just the Japanese word for dressing up in costume. naruto cosplay You know, like you do on Halloween... cosplay naruto except if you spent four months making your costume, Kingdom Hearts Cosplay and made all of the props yourself instead of buying everything out of a package at the temporary local Halloween Superstore cheap cosplay. In an indication of just how big the international cosplay community is getting, anime cosplay May will see the launch of a new, English-language cosplay magazine anime cosplay costumes out of Europe called Cosplay Gen. wholesale costume The 72-page issue #1 Japanese School Uniform will include tons of photos, interviews, profiles, DIY tutorials and a pull-out poster. Final Fantasy Cosplay Pre-order your copy now and receive a free issue of Otaku Magazine Bleach Cosplay.